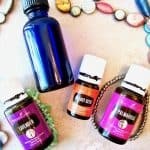 I recently started playing with essential oils to see if I could create my own DIY facial moisturizer at home. Why? First, in a thrifty attempt to save some money, and second, because our skin is our biggest organ and it’s just as important to put clean, nourishing products ONTO our skin as it is INTO our bodies with the foods we eat. I’m quite dedicated to keeping a clean gluten free and vegan diet, so am now working on transitioning all my beauty products to ones that are clean, nontoxic and cruelty free. The thing is though, trying to keep up a natural and inexpensive beauty regimen can sometimes feel like no easy feat. Many products labeled ‘natural’ still have chemicals in them, and the ones that don’t can be quite costly. Even the FDA’s website says that “the FDA has not defined the term ‘natural’ and has not established a regulatory definition for this term in cosmetic labeling”. Yikes! Am I the only one who finds that unsettling?! So, what’s a girl to do? Why, do it herself, of course! The result? Soft, smooth, healthy skin that smells good too! Plus, the oils are potent – a little goes a LONG way! – so even though you spend some money up front, you won’t have to restock your bottles for quite awhile. 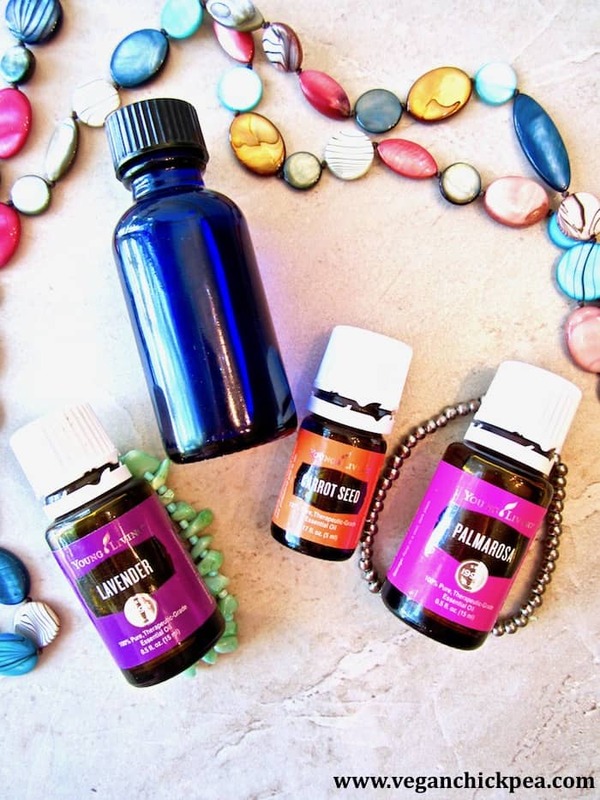 I’m really excited about discovering how simple, enjoyable and affordable it is to play with and create DIY recipes using essential oils. 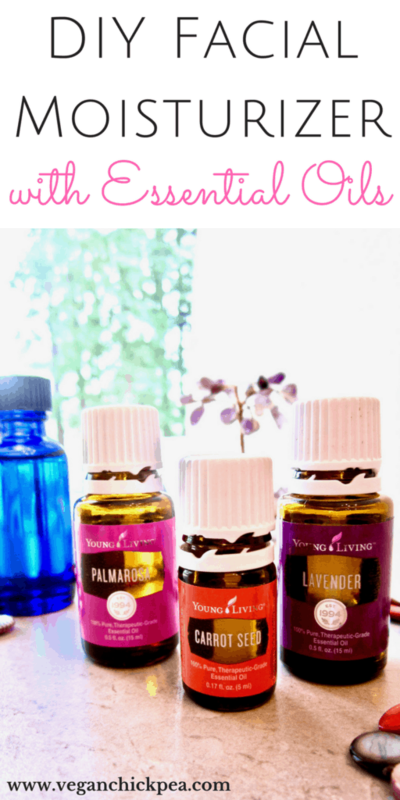 Here’s a guide to making your own facial moisturizer with essential oils at home! Contrary to what you may be thinking, most oils are your friend – regardless of your skin type! Many beauty products used to use mineral oil, which we now know is a toxic ingredient for the skin that clogs pores and leads to breakouts, but most oils out there actually help keep your skin balanced and fight bacteria. Many standard face cleansers, soaps and moisturizers on the market have chemicals that actually strip your skin of its natural oil, so your skin either gets really dry or tries to compensate by producing extra oil. Once you stop using those products and replace them with essential oils that naturally nourish, your skin will likely come into balance again and you’ll get that luxurious, glowing skin you’ve always wanted! You could just use your base oil on it’s own, but combining it with essential oils – which are derived from the leaves, petals, stems, bark and roots of plants – add lovely scents and have extra nurturing and healing properties of their own. For the essential oils, there are so many different ones to choose from to add to the base oil that it would be impossible to cover them all. 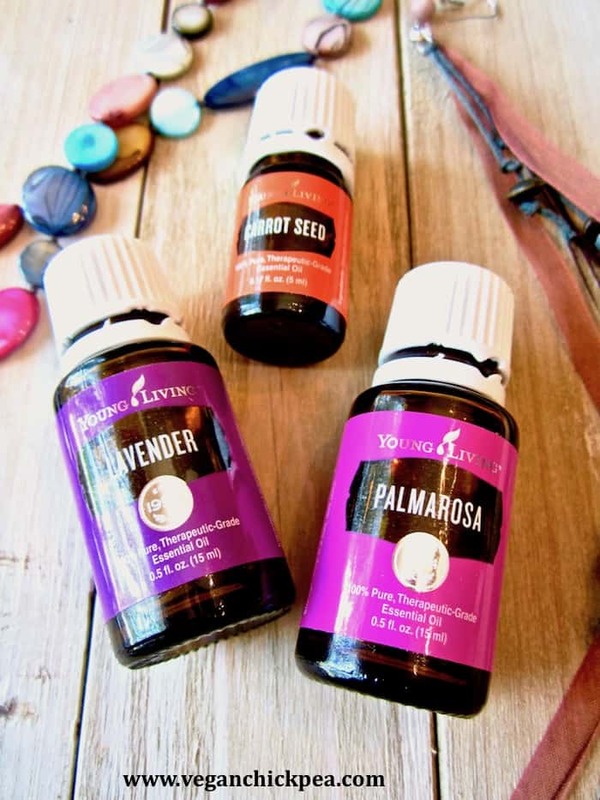 I used the Young Living brand of oils and specifically a combination of lavender and palmarosa. Other popular scents are peppermint, chamomile, rosehip seed, geranium, frankincense, tea tree, lemongrass, clary sage and rosemary. You can start with just one scent or mix multiple ones together, but I recommend just starting with one or two so you know which oils caused what result and get to know what you like. Finally, I added just a few drops of the Young Living carrot seed oil, which adds extra healing and nourishment to the skin. Carrot seed oil rejuvenates the cells, has high levels of antioxidants and a natural SPF of 35-40. This is completely optional and you can leave it out if you choose! 1) Always apply to clean skin, with clean hands! If you apply to an unwashed face, the oil will seal in dirt, dust and any makeup still on your face. You can do this at night before bed, or in the morning before you add makeup or other topical products. 2) Add about 3 – 5 drops of the oil blend to your fingertips or palms. Rub your hands together and gently dab onto your face until the oil is absorbed. I hope you love this DIY facial moisturizer with essential oils as much as I do! If you’re like me and don’t want harmful chemicals on your skin or in your home, then join us in the FREE 10 Day Chemical Freedom Challenge here! Mix all oils into the glass bottle. Start with just a few drops of the essential oil(s) - you can always add more! Shake the bottle to combine. You want to smell the scents but not have the smell be overpowering. Apply 3 -5 drops to clean hands. Rub together and gently dab onto a clean face. Store in a cool, dark place. Lasts about 8 - 12 months. Sarah Newman is the creator of Vegan Chickpea, a site sharing delicious vegan, gluten free and clean eating recipes along with lifestyle tips and travel reviews. The site isn’t only for vegans, but welcomes all those who want to integrate more health, wellness and sustainable choices into their daily lives. Make sure to stop by for healthy recipes or say hello on social media!